I started out to report on God's Army II: States of Grace thinking I could simply review the plot. That quickly turned out to be too overwhelming a task. Mormon missionaries get involved with a drive-by shooting somewhere near Los Angeles, leading to a surviving gang member being converted to become a member of the Mormon church. In the meantime, the missionary everybody thought was something of a slacker proves himself both the most human and humane, while the missionary everyone thought was the most devoted actually loses his virginity to a neighboring actress and attempts suicide. Along the way, a panhandling black preacher gets a new start on life, and the actress gives the dishonored missionary a new start on life. The movie ends with all the disparate characters ending up near the beach at a Lutheran nativity scene gathered together to kneel before and adore the Christ child. Necessarily, that is a rather truncated plot synopsis, and if it sounds a bit wacky, even tacky, forgive me. Personally, I actually thought it was a very good movie and worth watching, for the drama, the characters, the acting, etc. And if someone is offended by some of the Mormon buzzwords and stereotypes, they were nonetheless quite authentic. If there were no such buzzwords or stereotypes there would be nothing distinctive to distinguish Mormons from anybody else. I think the whole purpose of making such a movie was to make it a genuine slice of life wherein Mormons are experienced as they really are, which is primarily cultural. Unfortunately for the audience, however, the way Mormons, and even Mormon missionaries, experience life these days has become far removed from Mormonism's historical and theological roots. Indeed, in a movie made to highlight Mormon missionaries there was virtually nothing to distinguish these missionaries theologically from any other evangelical Christians, other than a "priesthood blessing." That is not only a distortion of Mormonism's historical and theological roots, the movie gives rise to real misunderstandings and perceptions for the evangelical Christian attempting to assay the religion from an evangelical Christian perspective. The movie's subtitle, States of Grace, underscores the Mormon theme of divine assistance toward multiple levels of personal reformation and progress. Unfortunately, that very concept is inimical to the actual state of grace defined biblically, which is not partial or measured, but whole and absolute. Writer/director Richard Dutcher would probably like to style all this as themes of forgiveness and redemption. But there simply is no forgiveness and redemption apart from real grace as defined biblically. As revealed in the movie's characters, duty, honor, merit, worthiness, heroism, reformation, and progress are all portrayed in abundance. Such qualities are quite admirable. But they simply are not grace; and in the movie, there simply was no real grace actually portrayed. Reformation is a poor substitute. Missing in both the movie and Mormonism is actual restitution, in which actual life is given, in exchange for that which is actually dead. Only therein is grace. 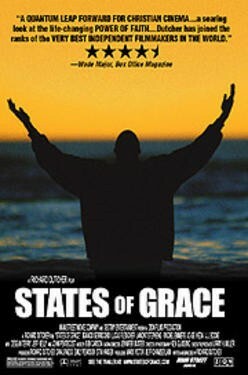 For more information on States of Grace, please see here, here, and here.